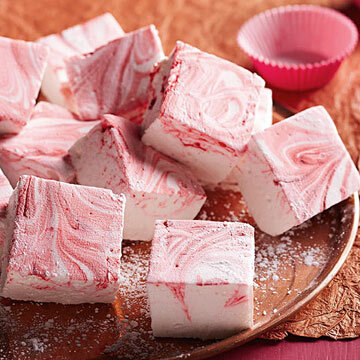 Homemade marshmallows are infinitely superior to store-bought--creamy and almost melt-in-your mouth soft. And peppermint is just one variation. In the baking aisle, find extracts like lemon, raspberry and cinnamon to customize your own marshmallows. The power of a stand mixer eases prep of this recipe, though a hand mixer works well. Line a 13x9x2-inch baking pan with plastic wrap. (For thicker marshmallows, use a 9x9x2-inch pan.) Coat with cooking spray; set aside. In a large metal or heatproof bowl, sprinkle gelatin over 1/2 cup of the cold water; set aside. In a 2-quart heavy saucepan, stir together the remaining 1/4 cup cold water, 1 3/4 cups of the sugar and the corn syrup. Bring to boiling over medium-high heat. Clip a candy thermometer to the saucepan. Cook, without stirring, for 12 to 15 minutes or until temperature reaches 260 degrees (hard-ball stage). *** Pour over gelatin mixture and stir well (mixture will foam and bubble). Meanwhile, beat egg whites and salt on high speed until foamy. Add the remaining 1/4 cup sugar, 1 tablespoon at a time, beating until stiff peaks form. With the mixer running on high, gradually add gelatin mixture, vanilla and peppermint extract. Beat for 5 to 7 minutes or until the consistency of thick, pourable cake batter. Spread in prepared pan. Drip about 25 drops of food coloring evenly over the top. Swirl with a knife. Coat a piece of plastic wrap with cooking spray; press it, coated side down, over candy. Chill at least 5 hours or until firm. In a small bowl, combine powdered sugar and cornstarch; sprinkle about a quarter over a large cutting board. Remove plastic from candy; invert onto cutting board. Remove plastic. Sprinkle with a quarter of the sugar mixture. Cut into 1-inch squares (larger if using a 9x9-inch pan), dusting knife with powdered sugar if necessary. Place candy, one-third at a time, in a large zip-top bag with the remaining sugar mixture; toss to coat. Layer between waxed paper in an airtight container in the refrigerator for up to 1 week or freezer for up to 1 month. * *Be sure to look for a product that is just egg whites. * **If you cannot find pasteurized egg whites, you can use regular eggs and pasteurize the egg whites: In a small saucepan stir together 2 egg whites, 2 tablespoons granulated sugar, 1 teaspoon water, and 1/8 teaspoon cream of tartar just until combined but not foamy. Heat and stir over low heat until mixture registers 160 degrees F on an instant-read thermometer. You may see a few pieces of cooked egg white in the mixture. Remove from heat and place saucepan in a large bowl half-filled with ice water. Stir for 2 minutes to cool mixture quickly. Place egg white mixture in the large mixer bowl. Continue as directed in step 4. * ***To test for hard ball, shortly before reaching temperature, dribble a small spoonful of the hot mixture into a bowl of cold water. Form the mixture into a ball with your fingers. Out of the water, it should hold its shape but be malleable. If it is too soft, retest using a clean spoon and fresh water.